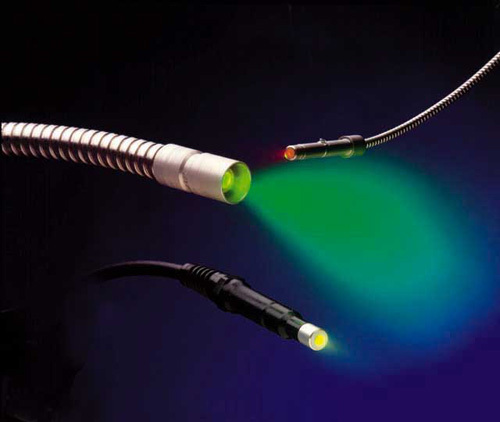 A liquid light guide is a single core transmitter of high intensity light. 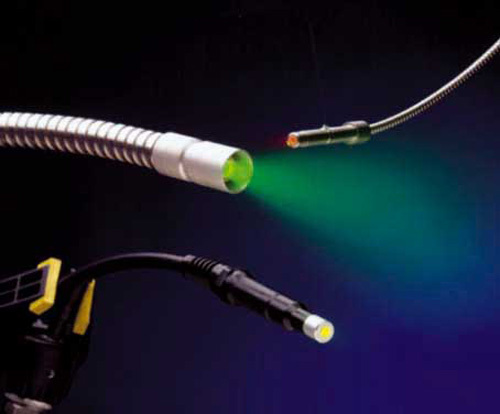 Various core materials are available to suit the UV, Visible and IR spectral ranges. 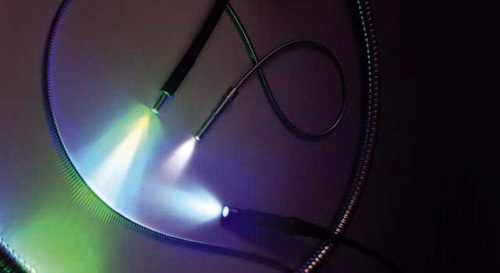 Liquid Light Guides have a greater transmission of high intensity light than glass fibre optic bundles. 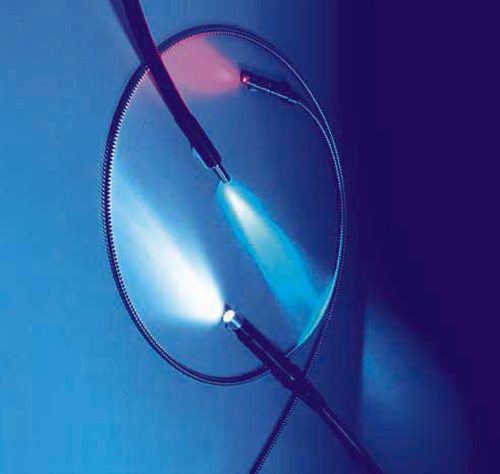 Liquid light guides are constructed with a flexible outer sheath containing a light conducting liquid core. The guide is sealed with high quality quartz windows and can be made transparent to all wavelengths from 230 nm (UV) to 980nm. The guides are produced in a wide range of core diameters and lengths and are available to standard or customer-specified geometry and performance. 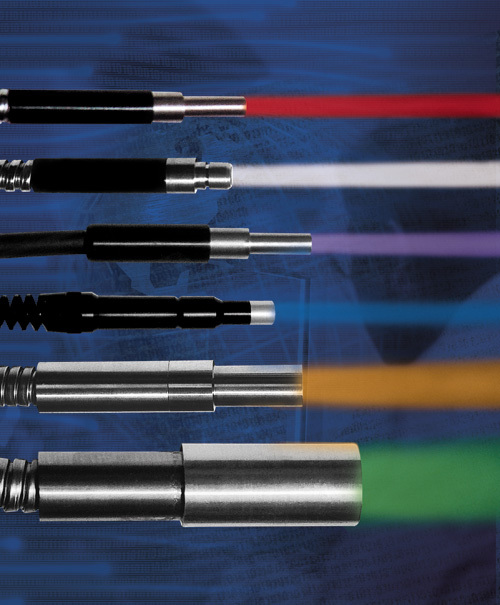 For dual source applications, we offer bifurcated liquid light guides (see diagram). Each leg has an active core of 3 mm and a length of 1, 1.5 and 2 meters (39, 59 and 79 inches). 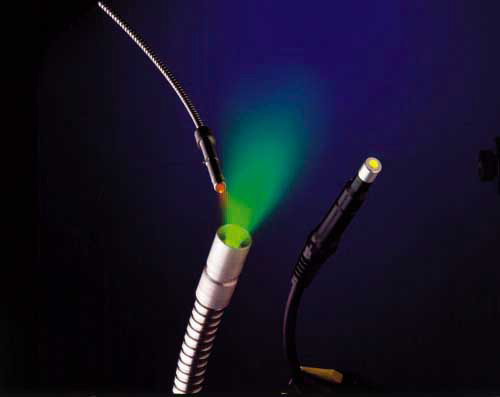 * Liquid Light Guides offer higher transmission, particularly in the UV - typical 1m glass or fused-silica fibre-optic bundles transmit only 40% to 60% of incident light, mostly due to packing losses - in contrast, liquid light guides transmit 70% to 90%. * Fused-silica fibre in particular is easily broken with even modest bending and twisting. Liquid light guides are rugged and our special sealing method, proven over many years use, ensures no leakage. * High NA provides a large light acceptance angle. Typically, liquid light guide NA is around 0.5 whereas that of fused silica is 0.22 to 0.25. Rofin is continuously improving its Liquid Light Guide range and so specifications can change without notice.